Convert is a free and easy to use unit conversion program that will convert the most popular units of distance, temperature, volume, time, speed, mass, power, density, pressure, energy, and many others, including the ability to create custom conversions! Where Is Convert Being Used? 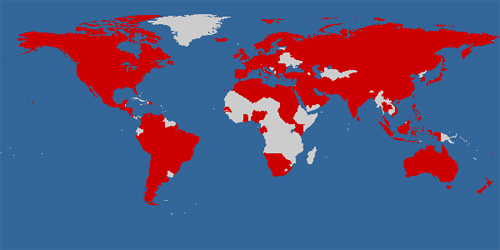 Convert is being used in the countries marked in red below. 105 countries, which is approximately 47% of what’s out there. It’s also being used someplace out of this world!